A unique lightweight, waterproof shelter made from FR Coated 70 Denier Nylon Ripstop Fabric* in licensed Multi-Cam Camouflage. The Swack-Shack is made from the best products on the planet, it's MADE IN THE U.S.A. and you can only get it at Survival Solutions Innovative Gear! You want QUALITY? You've come to the right place! Quality stitching, quality materials, double stitched S-folded seams, fold and a half borders. As our popularity increases, we're seeing similar, but poorly manufactured products. Don't be fooled by the rest, get the best! When you are "out in it", you'll need quality you can depend on! 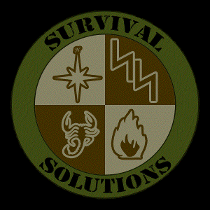 Survival Solutions Innovative Gear has been bringing quality Swack Shacks bashas to the market when there were no "camouflage tarps" to be found. We are still putting out the same high quality in every Swack Shack basha we make. Manufactured to specs as designed by George W. Jasper (author of the field survival manual 6 WAYS IN & 12 WAYS OUT, former U.S. Army Ranger and the commander and chief instructor with the United States Rescue and Special Operations Group), this "go anywhere" bivy is lightweight while offering the maximum overhead coverage of any bivy in it's class; and it's available in MULTI-CAM! Enough for you, your gear and some firewood too! 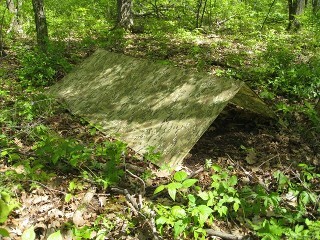 Just don't make any plans for a pantry; this bivy is made for those on the move and ready for the weather. The Swack-Shack weighs in at 1 1/4 pounds*. 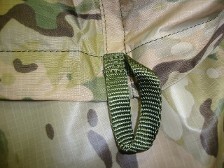 It's constructed of 70 D Nylon Ripstop, #46 Mil-Spec Bonded Nylon Thread, has 3 loops of 1/2" nylon webbing along the center and 4 - 3/8" grommets along each of the two sides. Here's your chance to surf the wave of the future! Any way you slice it, The Swack-Shack is a welcomed addition to your standard gear. 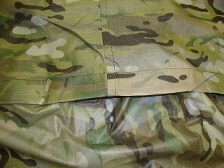 *This fabric is a fire retardant, IR compliant product. It's back-coated with urethane for superior protection from the elements. It's non-breathable and is face treated with a water repellent finish. It meets CPAI-84 fire protection standards. *Fluctuations in weight can occur due to back coating from the manufacturers, variations in width of the raw fabric bolts and even slight variations in hardware. This is entirely due to the fabric and materials available at the time of each production run and entirely out of our control. In some cases, the weight of each poncho can fluctuate 4 ounces overall due to these variations. We try to keep the web site updated as much as possible, but cannotalways keep up with current fluctuations in production. The weights listed on this site were accurate at the time they were posted though we cannot guarantee the accuracy of same due to the reasons aforementioned. All Swack Shacks are made the same way. 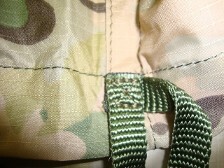 Though there are two apparent seams, there is actually only one seam. The ridge seam is not a seam at all. It's a reinforcement for the web loops. The reason for the off-center seam is a simple matter of cost. 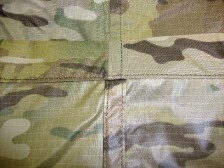 The Crye material is very expensive and it only comes 59" wide. In order to make a shelter 90" wide, half of another identical blank must be used. If not, you would have to use two identical pieces 45" wide resulting in 2 pieces of wasted material 15" wide by 108" long. Then comes the question of who is going to absorb the cost. 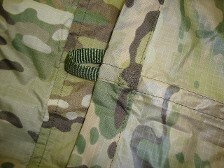 The seam itself is incredibly strong as the elements are S-folded and then double stitched in place. For all practical purposes, the actual seam exists only at very close examination. It is neither a weak joint, nor a weakness in camouflage.